My mom was always into the whole goat thing but, you know, she has been the biggest help of all. She gave up one of her gardens for the pen and has been the 'wheels' she has kept me going with encouragement and always suggesting helpful hints. Mom always wanted me to be horse crazy like her but she has accepted that I think my horse is cool and all but not the dream. I love Gracie (my horse) but I really love my goats! Mom is the rock. She is wonderful! I'd like to thank my Mother for everything! Thanks for hosting my first goat, Annie. Kathryn and David at Black Mesa have taught, helped, and been very generous to me. I and my Mom put down a deposit on a doeling at Black Mesa. Mom had also been e-mailing back and forth with Kathryn. Then when Kathryn and David came to talk to my 4-H Mom mentioned that if they ever needed an extra hand, I was good at working. A few weeks latter Kathryn told my mom her normal kidding help couldn't make it for this next round of kidding, she asked if I could come and stay in their guest house and help. Mom jumped at the idea and I ended up helping two days and Mom two days. Not all of the does kidded so I was invited back for an additional two days. They taught me so much during those four days and I even got to help kid my doe (Menolly)! I thank them for the teaching, the help with little crisis that we call them up about (trying to band Blaze and hoof trimming)! I thank them for being support and . . . . .Everything! Marshall Losey has just been a plain, good guy! He gave me another doeling after my sweet Annie died and he really didn't have to do that. Annie's death was not his fault! He simply let me loose in a pen of kids and said "Pick one", Annie's full sister and little Robin were tied. I asked him witch was the better goat and he said Robin had a better jaw. Robin is wonderful and Annie was wonderful! Marshall has been more than kind to me and he deserves a huge, giant thanks! When we were at a wall in our goat raising we ran to the computer for help. We learned to climb over each wall or break it down! The websites we found and continue to rely on were free and the people posting it are good people. They didn't have to have all of the diseases on there or treatments. But they did and we have used the heck out of those websites! 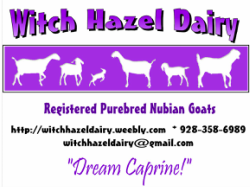 I would like to thank: Fias Co Farms, Onion Creek Ranch,Olson Acres, Rockyrun Farm, Goat Connection, Goatbeat, and the folks who run AZ Goats and NubianTalk, and so many others for the info that has helped me on my way! Loma is where we got Willy, our buck. He is wonderful, they were wonderful and I think I needed to mention them! Willy couldn't be better! He has all of the little moon spots, a belt, and little white tips on his feet (very cute)! His mom is a awesome milker and we have big hopes for Will! Thank you Loma! Jesse sold me Nebula, one of our herd sires, a lot cheaper than she should have. Nebula is a great goat! Jesse raised him and I appreciat every thing Jesse has done for me. Nebula has been a great addition to my little herd and I don't regret getting him! Jesse certainly deserves a thanks! Mary kindly let me get a hold of my two beautiful Anatolian dogs. We may have never gotten Ayya and Batur without her help. We will be using these dogs for the rest of their lives and are very thankful that we now have them. The LSGD's are very valuable and we are glad to have them!